AWS gives organizations of any size the ability to implement flexible and scalable video processing for highly distributed and personalized access to video. Whether you need live or on-demand content, extend your reach to stakeholders and broaden your impact with video solutions which enable a broad range of corporate streaming video applications. Whether the event is a townhall meeting, employee training, product reveal, or a corporate channel, streaming content live to any device is simple with the AWS Media Services and Amazon CloudFront. Now you can deploy the CloudFormation template with just one button and customize to your needs. Video latency remains one of the toughest challenges OTT and online video providers face. This white paper will help readers understand exactly what latency is, what is considered low and ultra-low latency, and how changes in the video encoding and packaging workflow can help content publishers and distribution platforms reduce latency and provide a better experience for their customers. As video quality, accessibility, and utility skyrockets, how video providers create and deliver professional-grade video services changes dramatically. Learn about the benefits of moving video operations to the cloud, the pros and cons of conventional approaches, and tips for adapting to coming changes. This webcast demonstrates specific ways companies can use AWS Cloud services to take control of and get the most from video workflows. Crafter Software Video Center enables leading enterprises to manage and publish live and on-demand video for a variety of applications to better connect with employees, partners, and customers. It leverages AWS Media Services and several AWS services for a unique, customizable, and cloud-based enterprise video platform. Creating a VOD library of your training, broadcast, or mission is now simpler with the Video on Demand on AWS solution. With one button, it ingests your videos, encodes them using AWS Elemental MediaConvert into the required profiles, and then publishes them to Amazon CloudFront or any other CDN of your choice. And with the flexibility, scalability, and reliability of the AWS cloud, customizing the solution is simple. This webcast provides prescriptive guidance for building video-on-demand workflows on the AWS Cloud, which provisions the services needed for a scalable, distributed architecture that ingests, stores, processes, and delivers video content. Machine learning can enhance traditional corporate streaming applications, dramatically increasing workplace efficiencies. By automating the creation of captions, meeting organizers can ensure presentations can be immediately released with text on screen to enhance their audiences’ experiences. Automated translations of those captions enable easier comprehension by employees in other countries. Additionally, this text can also be fed as metadata into media management solutions to enable intelligent search. Corporate video has evolved to enable employees to be able to search where executives and actors appear in a video, to view and search captioned text, or to listen to an audio track in their native language. 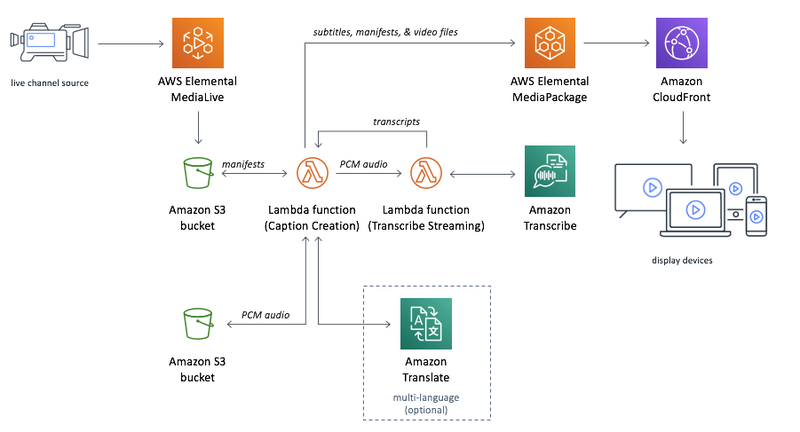 Learn about the use cases for enhancing live and on-demand video using machine learning, and how to automate workflows for captioning, translation, and object recognition. Learn how Marriott International uses services from AWS and AWS Elemental to live stream its Awards of Excellence ceremony to employees around the globe. Learn how Viocorp, an enterprise video platform company, uses AWS Elemental Cloud to live stream complex, multi-day events such as AWS re:Invent. Leading companies are already using the corporate streaming solutions. Contact our experts and start your own AWS Cloud journey today.